When I was dreaming up this recipe, I was seeing bright, vibrant colors: electric-green mint, magenta cranberries, and golden-brown pecans. Oh, and I was also thinking about the flavors. Don’t you worry. 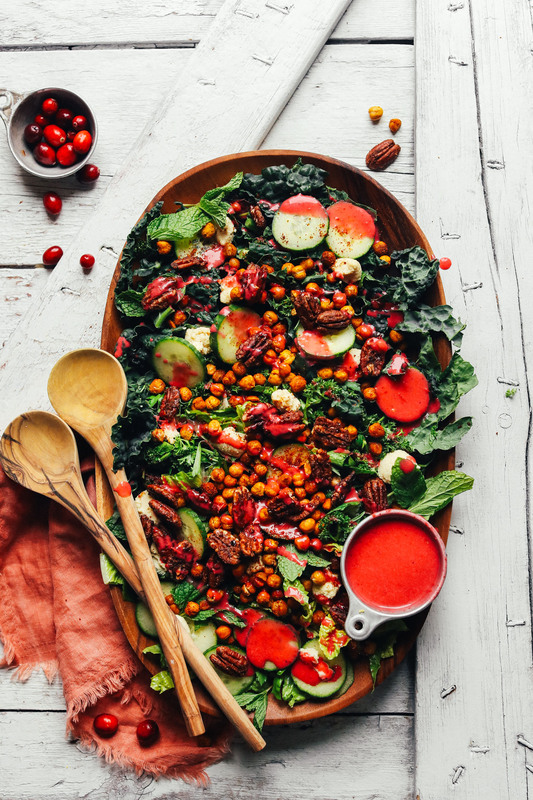 This herbed green cranberry salad is a total flavor bomb! Let’s do this! This 30-minute recipe all starts with a sumptuous cranberry compote we’re going to turn into a creamy vinaigrette. 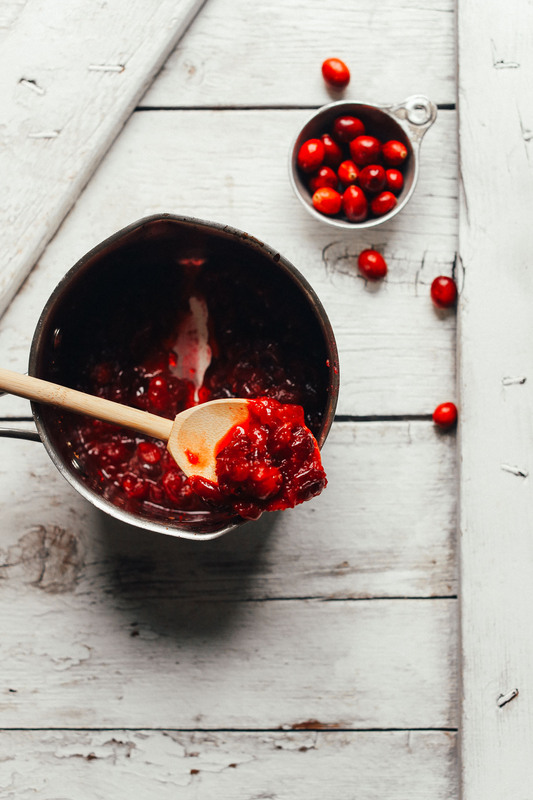 Cranberry compote is so simple to make. Simply boil with a sweetener, some zest, and citrus juice for 10 minutes and voila! You’re ready to go. Next, simply blend or whisk with red wine vinegar, lemon juice, maple syrup, salt, and pepper and you’ve got a creamy, tangy, naturally sweet dressing on your hands. Another star ingredient? 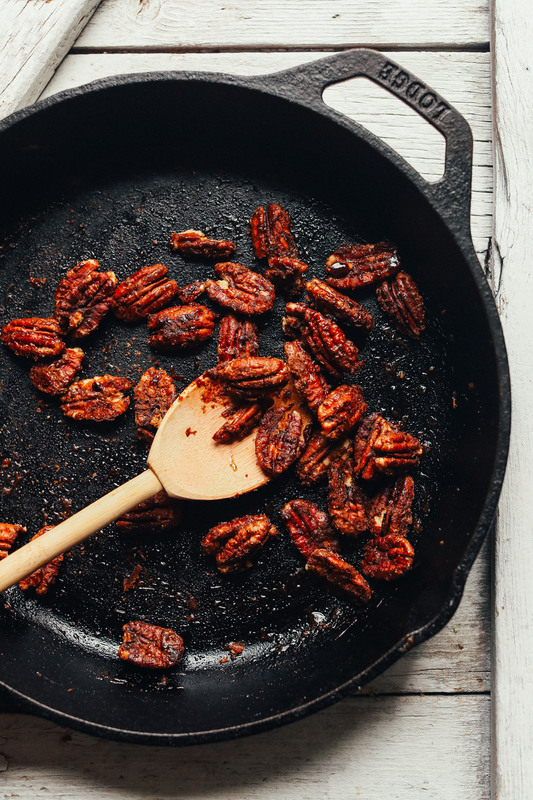 These 1-pan roasted candied pecans. I know! Simply toast raw pecans on the stovetop. Then drizzle on some maple syrup, coconut oil, coconut sugar, and some spices and you’ve got 8-minute candied pecans. It’s that easy. All that’s left to do is plate and serve. I went with mixed kale and romaine for my base. Then I dressed it with crunchy cucumbers, fresh mint and parsley, and the candied pecans. For more “oomph,” I also added some of my 5-Minute Macadamia Nut Cheese (total swoon fest) and some baked crispy chickpeas. These toppings are optional, but they add more protein and fiber to the mix, as well as flavor and texture. This would make the perfect side or entrée for holiday festivities, dinner parties, or when you want a more exciting salad on the menu during the week. I love that it’s seasonally versatile, takes just 30 minutes to make, and is such a beautiful way to get more greens in your life. 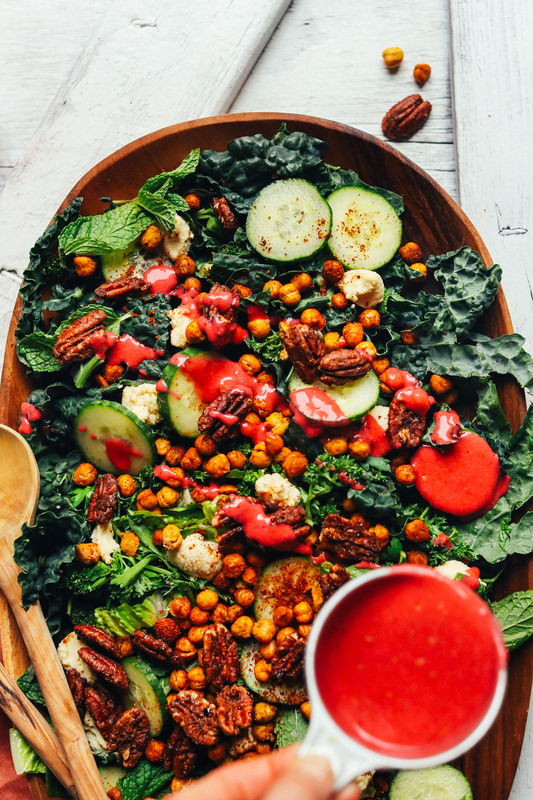 If you’re into salads, be sure to check out a few of my other favorites: Garlicky Kale Salad with Crispy Chickpeas, 20-Minute Asian Kale Salad, Blissed-Out Thai Salad with Peanut Tempeh, and Curry-Roasted Lentil & Vegetable Kale Salad. If you give this recipe a try, let us know! Leave a comment, rate it, and don’t forget to tag a photo #minimalistbaker on Instagram. We love seeing what you come up with. Cheers, friends! An herbed green cranberry salad with roasted, spiced pecans, nut cheese, and a vinaigrette! Just 30 minutes to prepare this plant-based side or entrée! If serving with chickpeas and/or macadamia nut cheese (links above), prepare now (optional). 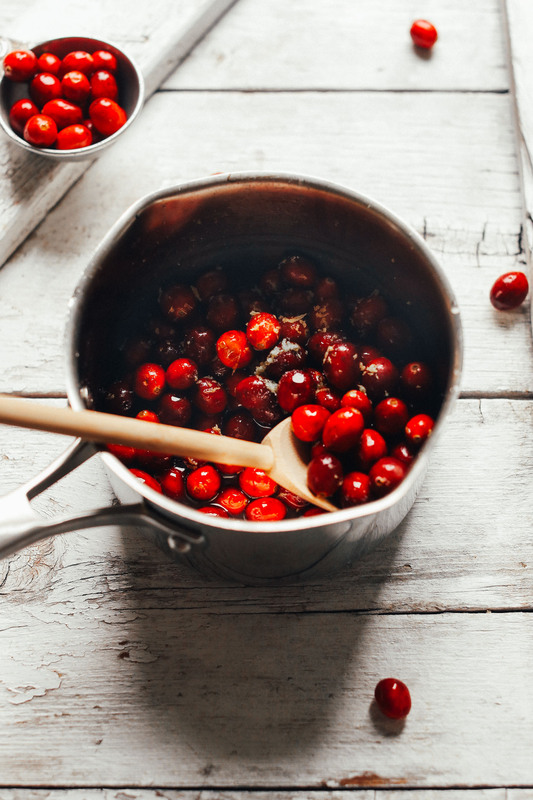 Prepare cranberry compote by adding cranberries, maple syrup, lemon or orange zest, sea salt, and lemon or orange juice to a small saucepan and bringing to a boil over medium-high heat. Once boiling, reduce heat to a simmer and cover. Cook for 10 minutes or until the cranberries resemble compote. Remove from heat and transfer to a shallow bowl. Set in the refrigerator to cool. In the meantime, roast pecans. Heat a medium cast-iron or metal skillet over medium heat and add pecans. Toast for 5 minutes, stirring frequently, or until deeper in color and fragrant (be careful not to burn). Add coconut oil, maple syrup, coconut sugar, and spices of choice and stir to combine. Cook for another 1-2 minutes. Then turn off heat and let cool in the pan, stirring occasionally until serving. 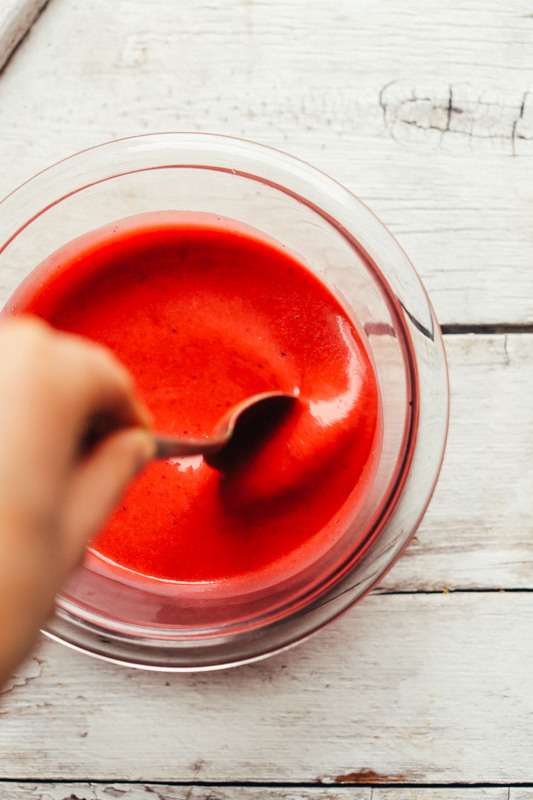 Make dressing by adding cranberry compote to a small mixing bowl OR a small blender, such as the Magic Bullet (this will yield a creamier dressing). Add maple syrup, salt, pepper, red wine vinegar, lemon juice, and oil and whisk or blend on high to combine. Add enough water to make a thick but pourable dressing (~2 Tbsp or 30 ml // as recipe is written // adjust if altering batch size). Taste and adjust flavor as needed, adding more lemon or vinegar for acidity, salt or pepper for overall flavor, or maple syrup for sweetness. 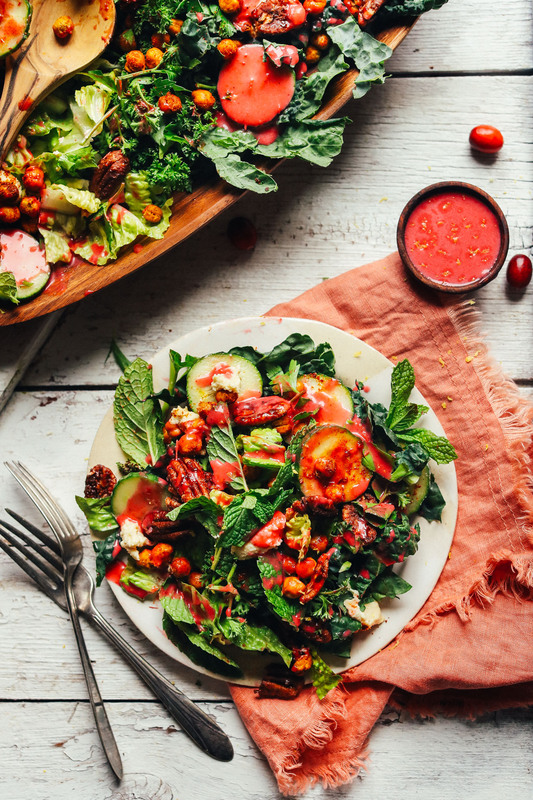 Assemble salad by laying down mixed greens, herbs, cucumber, and roasted candied pecans in a serving platter or bowl. Add additional toppings, such as nut cheese and chickpeas (optional). Serve with dressing. Best when fresh. Store leftovers undressed in the refrigerator up to 3 days. Dressing will keep in the refrigerator up to 5 days. Store any leftover cranberry compote up to 1 week. Use to make additional dressing or add to other desserts (such as pies, crisps, or cocktails). *Nutrition information is a rough estimate for 1 of 4 servings with all of dressing (using lemon juice), with pecans and oil, and without nut cheese or chickpeas. *Cranberry compote adapted from Ambitious Kitchen! This recipe was fantastic. My only disappointment is now that I’m hooked I can’t find cranberries anywhere! ? When they come in season I will be buying a ton of fresh and stocking in my freezer so I can make this whenever I want. My local stores didn’t have them frozen! Btw, the candied pecans with the addition of cayenne pepper was incredible. The whole family loved them!! Lovely main dish salad! Made with the pecans and crispy chickpeas. Did add one extra tablespoon of maple syrup to the dressing as mine turned out a little too tart for our taste. I used orange juice in the compote and lemon juice in the blender for the dressing. Would definitely make again. I made this salad for our Christmas dinner and it was well received. I made the suggested toppings which definitely bumped the salad to another level and The dressing was perfectly balanced and delicious!!!! Please note the 1 tablespoon of lemon juice in vingarette ingredients shows as 30 ml while 1 Tablespoon is 15 ml. Looking forward to making this salad recipe with your shepherd’s pie recipe for guests tomorrow night for dinner. Hope you love it, Shelby! Turned out really nice! Also made the apple crisp recipe for dessert. The tart flavor of the cranberry dressing was delicious and the color very appealing! I got many compliments on this salad! The pecans were delicious too! Thanks for all the great recipes. Could honey be substituted for the maple syrup? Or any other suggestions? Yet another fantastic sounding salad recipe. Your salads always inspire me to up my salad game and this one has some of my favourite ingredients combined. Pecan nuts, chickpeas and cranberries. Unfortunately in Germany we usually have to go for the dried (and often sugared) cranberries. Thanks for sharing this one, I pinned it on the Pinterest. 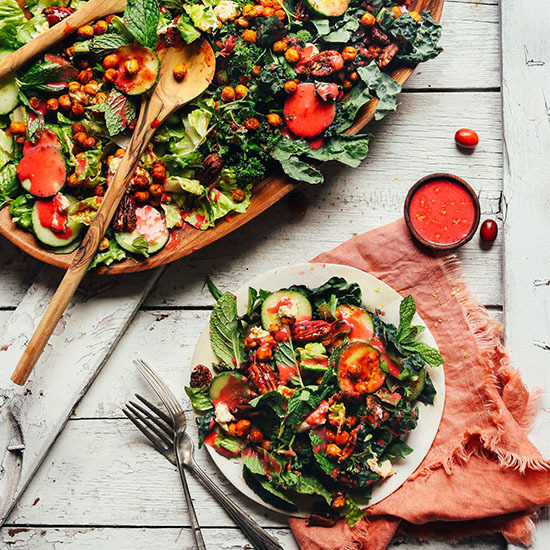 Love the tart flavors and colors combined in this salad. I always love swapping out different ingredients whenever I make one too! Sometimes, I’ll add in roasted walnuts or candied almonds instead of pecans, or use fresh cranberries and a squeeze of lemon or orange juice! Hello! I have settled on this beautiful salad to accompany our our Christmas dinner. I want to make it in all it’s glory but I am unsure if I am supposed to spice the baked chickpeas for this recipe as the linked recipe states or if the link is merely to gain the method to cook the chickpeas? Oh, I did spice them as the recipe states! But you can season them however you’d like. You continue to give me the best signature dishes for the Holidays and every day! Thank you for doing what you do. Of all your amazing recipes, the amazing photos, and the sweet comments, I dream of being your house guest, always. Thank you for all your creative work you share. biscuits, sauces on and on. You nailed it with the dairy free pesto I’ve used over and over.